Police carrying out checks at an airport in southern Germany discovered several school-aged children travelling ahead of the holidays. Reports concerning 10 families have now been sent to education officials in Bavaria, German media report. It is believed the families caught at Memmingen Airport were trying to avoid travelling at the peak holiday time, which can be a lot more expensive. In Germany parents are legally obliged to send their children to school. 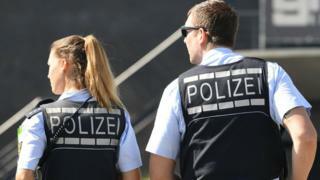 The Memmingen families were allowed to fly off on holiday despite the questioning, a German police spokesman told the BBC. "It would have been disproportionate to take the children back to school, as the families had paid for their holidays," he said. The Spiegel news website reports that the parents now have two weeks to explain why they took their children out of school. If the reason is not good enough each family can be fined up to €1,000 (£876; $1,177). Last year a case in England went to the UK's Supreme Court, which ruled against Jon Platt, who had taken his daughter out of primary school in term time for a trip to Florida. He had won earlier court battles against a £120 fine from Isle of Wight council, but the Supreme Court ruled that parents could be fined for unauthorised absences, except for reasons such as illness or family bereavement. You mean you're not on holiday yet? The rules in Germany vary from state to state. But fines are quite common (and home education is effectively prohibited). In Saxony, eastern Germany, fines of up to €1,250 are imposed on parents if their child has an unauthorised absence of five or more days in one school term. The daily Sächsische Zeitung reports that fines were imposed in nearly 5,680 cases of truancy in the state last year, generating €618,000 for local authorities. The city of Leipzig had the most cases - more than 2,280. What happens in other countries? In Austria, the authorities are increasing penalties for parents in similar cases. In January, Education Minister Heinz Fassmann announced fines ranging from €110 to €660 for parents whose children played truant. The penalty would escalate depending on the length of absences, he said. France relies on dialogue between school and parents to tackle truancy, but as a last resort a fine of €135 can be levied, LCI news reports. It can be cut to €90 for rapid payment, or raised to €375 for significant delay. Do holiday times differ much in the EU? Yes - the dates of school terms and holidays even vary from region to region in many countries. In France, all children get two months in the summer (7 July-2 September), but the dates of their other holidays depend on their home region. There is also much variation in school holiday dates among Germany's states and in Switzerland. The EU's Eurydice education website reports that France has 162 school days in the academic year, though the figure is higher in upper secondary education. In most European countries the figure ranges between 170 and 190 days. But in Denmark and Italy it is 200 days. At Christmas, nearly all countries have two weeks of school holidays. But the summer break varies a lot. In the UK, some German states and the Netherlands it is six weeks. But children in Italy get between 12 and 14 weeks' holiday in summer, while many also get 13 weeks in Latvia and Portugal.